Some senior citizens at a public housing complex in Weymouth, Massachusetts, say bed bugs have been a problem in their building for years, but not enough is being done to fix the problem. A group of senior citizens at a public housing complex in Weymouth, Massachusetts, say bed bugs have been a problem in their building for years, but not enough is being done to fix the problem. Mary Andrade recently had to pack up the apartment she shares with her 84-year-old husband to move out. "We’ve lost a lot. We are going to another place with no mattresses," she said crying. "We have nothing." Her apartment is in Pope Towers — a complex for low-income elderly and disabled residents owned by the Weymouth Housing Authority. Andrade pointed out her couch, recliner and other pieces of furniture she couldn't take because she said her apartment is infested with bed bugs. Resident Cheryl Mullaney told the NBC Boston Investigators that she too has bed bugs in her apartment. She first noticed them in May when a child spent the night and woke up to bug bites. The NBC Boston Investigators asked her if she feels bugs when she’s sleeping. "I don’t sleep," she answered tearfully. "There’s one right there," Mullaney pointing to in a bedroom under a mattress. "And it’s alive." The Weymouth Housing Authority has had exterminators treat her apartment three times in recent months, but Mullaney said it hasn’t stopped the bugs. 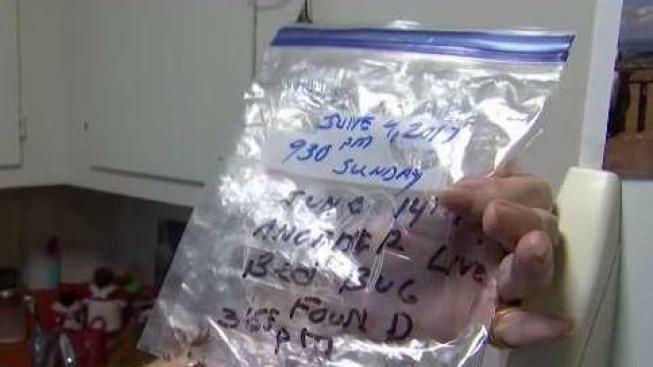 She showed the NBC Boston Investigators a baggie with nearly two dozen dead bugs in it. "June 4th, 9:30 p.m., June 14th, another 12 bedbugs," she said. Mullaney and other residents keep the bugs to try and prove the problem persists. Bed bugs have been an issue at Pope Towers since at least 2012. Housing Authority Executive Director Mike Flaherty has insisted the problems are isolated and under control. The NBC Boston Investigators went through extermination records and health department complaints and found in the last three years, more than a dozen units and the laundry room have been infested multiple times. "You feel like you’re just living in a — like something’s wrong with you, that you’ve done something wrong," said Andrade. "I don't understand why, why you let people live like this." Flaherty declined repeated requests for an interview. When the NBC Boston Investigators tracked him down to a housing authority property, he said he would not answer questions. "I’ll tell you I work very hard on all of our issues," he said. "And I’ll leave it at that." Weymouth Mayor Robert Hedlund said in an email, "Like many buildings, Pope Towers has had bed bugs on and off for a few years. The housing authority has been utilizing the services of licensed pest management companies to investigate and chemically treat impacted units. Chemical treatments can take 3-5 treatments or more to be effective." The mayor went on to say, "...it has been difficult to thoroughly treat the units for three reasons. Most of the occupants are in the units for a good portion of the day. The units are relatively small and can contain quantities of contents that make it more difficult to treat." And he wrote, "Some occupants are concerned about informing the Housing Authority that they have bed bugs due to the stigma associated with them." Records show in the last three years, the Weymouth Housing Authority has spent nearly $10,000 of tax-payer money spraying at Pope Towers with bed-bug killing chemicals. But both the CDC and EPA say spraying is often not enough. The NBC Boston Investigators asked several pest control companies to weigh in, including Brad Hall of NW Pest Control. Hall has not been inside Pope Towers and said every situation is different. Pope said he would find an alternative to spraying alone. "If what you’re doing isn’t working, you’re just banging your head against the wall," Hall said. "There’s always something you can do." Both state and federal health agencies recommend integrated pest control which goes beyond chemical treatment. Work in a grid, spraying units surrounding the infested unit to avoid re-contamination. Use the more expensive but gold standard heat treatment to kill bugs. And make sure residents pack up all bedding, clothes and move furniture to clear the path for exterminators. Packing properly can be a challenge for elderly or disabled residents. The Brockton housing authority, for example, hires pricey, but professional packers. Those methods raise the price considerably for public housing authority, but Hall insists, "If you can do that and the prep right, then the treatment is going to work and then you’re done." Flaherty would not say if the authority has considered the more expensive options, but residents said that after we started asking questions, there has been a flurry of activity which includes more spraying, crews in hazmat suits pulling furniture out of the building, and residents who say they were once told they couldn’t break their lease — now granted transfers. The move is a bitter pill for Andrade who says she feels driven from her home. "To always be on the lookout for the bedbugs — always," Andrade said. "There's no end to it." The NBC Boston Investigators also reviewed the housing authority’s annual inspections. They haven’t filed for this year yet. There was no mention of bed bugs in last year’s report and the authority didn’t inspect its buildings in 2015. When asked why, Flaherty answered via email, "Work load." The Massachusetts Department of Health says bed bugs are a violation of the state sanitary code, but enforcing that code is left to the local board of health.